Shujan Bertrand only uses squares and rectangles to craft her totes, so that no fabric goes to waste. Shujan Bertrand designs for life's daily rituals: "sharing good food, drinks, and good company." This tote is all over those rituals. 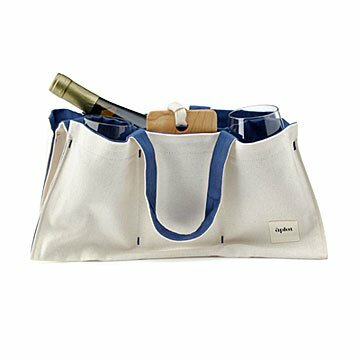 It holds one bottle of wine, two unbreakable glasses, and a mini maple cheese board. Shujan was inspired by her French husband's family home, which was "always filled with friends and neighbors, coming over to eat and drink homemade wine." Are you swooning yet? Here's more to love: She only uses squares and rectangles to craft her totes, so that no fabric goes to waste. Tote and cheese board handmade in San Francisco. Wine glasses made in China. Tote is washable and reusable.